These were the stirring words from Governor Kevin Reilly at the launch of Prisons Week on 10th October 2016. Kainos Community and Langley House Trust (Kainos’ parent charity) was pleased to join almost 100 others for the launch which took place in the chapel of HMP Pentonville. Prison chaplains, prison staff and a host of charities gathered together for the service to mark the start of Prisons Week which runs from 9th – 15th October. Notable speakers included the The Rt Rev James Langstaff, Bishop to Prisons and Dr. Hugh Osgood, Moderator of the Free Churches Group and one of Langley’s patrons. Inmates from HMP Pentonville took part in the launch, with with one young man performing an emotive poem covering restoration, forgiveness and the need to make amends. His inspiring and charismatic performance was balanced by a clear genuineness. Another inmate shared a poignant letter from his partner who had just given birth to their child – the letter was full of hope that the inmate could make use of the time in prison to change and start afresh. They were stirring reminders that change could be possible for those held within prison, despite the problems that have beset the prison system in recent years. The prison system has faced increasing challenges of late, with staff shortages, overcrowding and increased rates of suicide and violence affecting many prisons. Liz Truss, the new Justice Secretary has committed to investing more in prisons to provide additional staffing and looks set to continue the prison reform promised under previous Justice Secretary, Michael Gove. 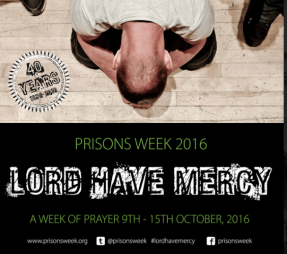 For the last 40 years, Prisons Week has sought to inspire and motivate Christians to pray for everyone in prison and all those affected by it. Each day focuses on a different aspect of Criminal Justice and includes prisoners, victims, families and all those who work in the Criminal Justice system. Momentum around Prisons Week has grown over the last few years, with more churches and faith communities playing a role in prison life. For more information on Prisons Week, visit prisonsweek.org.